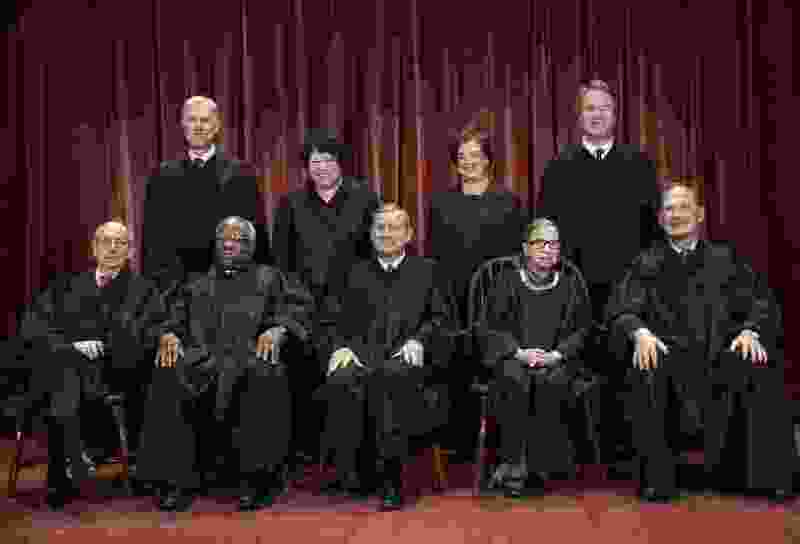 (J. Scott Applewhite | AP file photo) In this Nov. 30, 2018, file photo, the justices of the U.S. Supreme Court gather for a formal group portrait at the Supreme Court Building in Washington. Seated from left: Associate Justice Stephen Breyer, Associate Justice Clarence Thomas, Chief Justice of the United States John G. Roberts, Associate Justice Ruth Bader Ginsburg and Associate Justice Samuel Alito Jr. Standing behind from left: Associate Justice Neil Gorsuch, Associate Justice Sonia Sotomayor, Associate Justice Elena Kagan and Associate Justice Brett M. Kavanaugh. The Utah Attorney General’s Office now argues that for the U.S. Supreme Court to remain consistent with a half century of its own rulings, it should reject an appeal by the Utah Republican Party challenging a 2014 state election law. That law, called SB54, allows candidates to qualify for primary elections either by collecting signatures and/or through the caucus-convention system. The GOP asserts that the law unconstitutionally interferes with its right to choose how to select its own nominees. The state originally waived its right to file a brief about whether the Supreme Court should accept the case. But the court in December asked the state to file such arguments, which it did this week. The GOP had portrayed the court’s request as a sign that it is seriously considering accepting the case. “For nearly 50 years, this court has repeatedly recognized the states’ power to prescribe political party nominations by primary elections,” Utah Solicitor General Tyler Green wrote in the brief. “Not once has this court — or any other court — cast constitutional doubt on that practice,” which it said has led every state to now use primary elections, and not conventions. Utah’s old system allowed some candidates to skip primaries if they could win by big enough margins at conventions. The state argues that SB54 does not unduly restrict the party, but allows all of its members to resolve intraparty disagreements in a primary — and allows wider, more representative participation. The Utah Democratic Party also filed a brief this week urging the Supreme Court to reject the case. It said SB54 had been accepted by all Utah parties except the GOP, and is reasonable. It argued that right-wing Republicans want to return to a caucus-convention system because it gives them more power to block candidacy from moderates and others that conservatives may consider to be members of the party in name only.